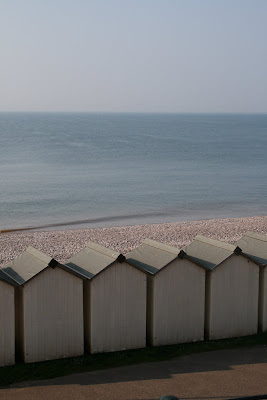 At the beginning of last week I trundled off to Budleigh Salterton, by the sea, to spend some time with my Mum making curtains for their new Bed and Breakfast business. This has been a dream of theirs for so many years and they have waited so patiently for the time to be right... well, now it is and they have the most amazing house right on the beach!!! ... the beach stretched away before me, the colours, sounds and smells assaulted my senses and I drank it all in... WOW!! ... also stopping to take a few pictures. Isn't it beautiful? Pebbles - the name of the B&B - is about the 2nd or 3rd house along from where you can see the houses begin:: those boats and beach huts are directly in front of it... who wouldn't want to stay there? I have to let you into a secret now.. both Mum and I have been sewers for most of our lives, my mum teaching me how to sew clothes for my doll on her Singer hand sewing machine when I was about 7 (I still have the doll and the dresses!!)... BUT we both hate making curtains!! No matter how many times you work out your fabric lengths and how many you need, or how precisely you match the seams, the fabric just seems to take over and one length is longer than the other, the straight line you thought you'd carefully measured and cut ends up being all over the place... it's a nightmare! Grr... Fortunately though, we had each other to moan at and we spent a lot of time laughing at our incompetence and how cross we were getting!! Here is mum working out the measurements for yet another pair of curtains!.. do you think the calculator is big enough??? This is where it gets tricky - 3 widths of curtain fabric and 3 widths of bonded interlining each 2m long and mum starts to disappear! 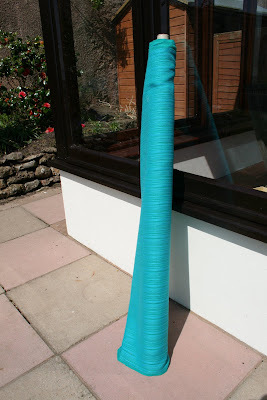 In 3 days we did manage to make 3 pairs of curtains and 2 throws for the sofa from some fabric that we picked up at the local recycling centre.. that was a real find.. its John Lewis fabric from the 70's, about 12 m and we paid £2!! What a treasure!!! After all that curtain making.. pictures of the finished ones coming soon.. I needed to get down to some beady business. 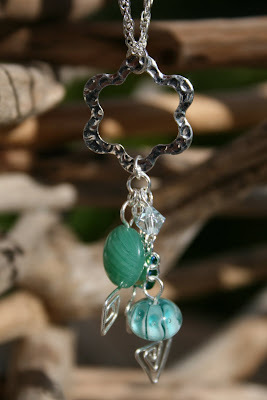 I must have decided to use these beads as I had been inspired by the colours of the sea at Budleigh.. 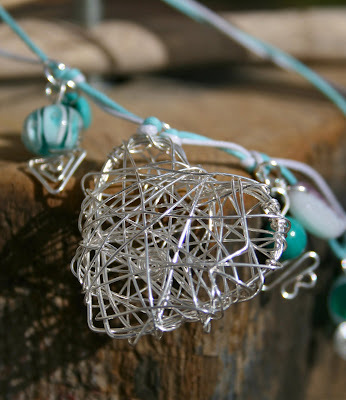 I love the heart on this. 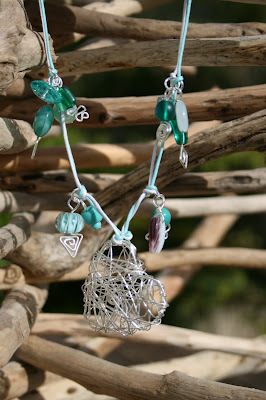 It was a bit of an experiment with my silver plated wire, but I think It's turned out really well.. I think I will make more - what do you think? Well, that's all for now folks.. the not so little people are returning from a 3 week holiday in Australia with their dad today so I must go and bake a cake in celebration. What a beautiful house and ideal location - do you think they'd notice if I moved in?!!! I can sympathise on the seagull front too - I got 'splatted' on Friday - yuk!! Oh that looks truely wonderful, can't wait to come and stay, almost worth going back to Britain for! Hello - I have just found your blog. And what a lovely pretty blog it is. 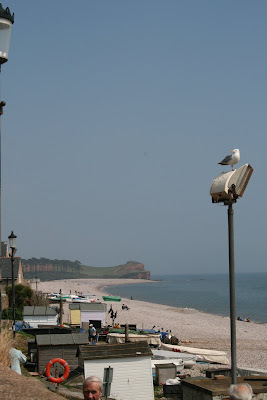 I used to live in Sidmouth so I know Exmouth quite well. Where abouts in South Hams do you live? I know South Hams very well too. The mis-hap with the seagull is suppose to be lucky! Good luck with the curtains, I know exactly what you mean about the material taking over. I am due to start a largest project this weekend similar to yours so I will be very careful with measuring an cutting. 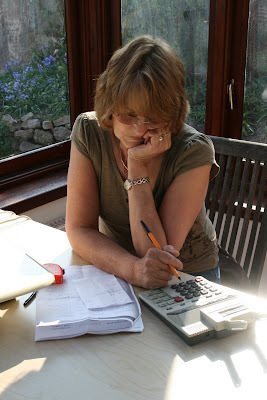 Hello, Just popped over from Janes' (Posy) to welcome you to the wonderful world of blogging. What a beautiful place. I feel the same about sewing curtains and I remember my mother didn't like it either. I love your jewelery especially your earrings. I came on your weblog through Posy and I will put it on my list of feeds. Greetings from the Netherlands! This post reminds me of my sister and I. She used to come and help me with my curtains. I know exactly what you mean about the lengths and everything. This last time I made curtains I had to do it all by myself, as we have moved to Crete and she is no longer within easy reach. Hi WOW what a lovely beach how lucky is your mum. I also love your jewellery it's very fresh and unique. Are you selling on Etsy?? What a lovely place - despite the seagulls! Came to your blog via Jane's recommendation. The silver heart looks lovely. Off to read some more. 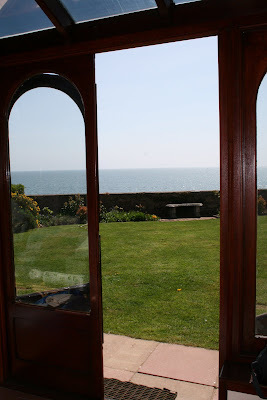 I heard about your blog from 'posy', the house looks beautiful, and what a wonderful location! That is just where I would love to be, I daydream about living near the sea and it looks just about perfect! Hello Yvonne, what a lovely BB your mums is going to be, gorgeous views. I wish her lots of luck in her new venture. As for being splatted, well thats good luck too. Have a lovely weekend. je découvre votre nouveau blog grâce à "Posy" ! Tell your mother her house is very beautiful ! Salut amical de France !